Please join us for a showing of one of the most important fish conservation films ever produced. 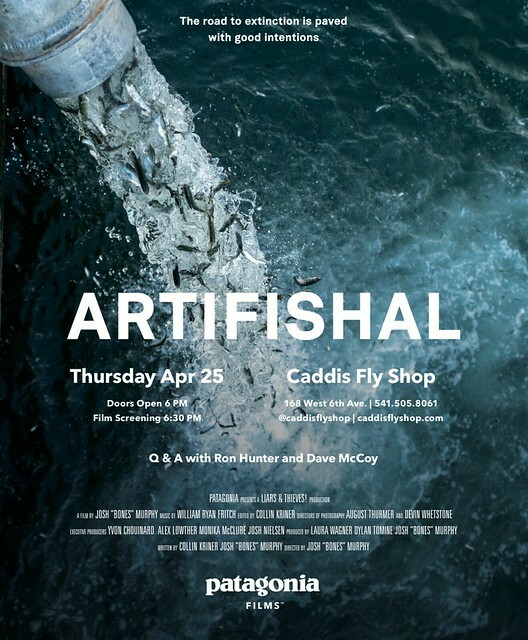 ARTIFISHAL sheds light on our failings in producing and protecting fish. If you want the truth about hatcheries and hatchery fish this film is a must watch. At present we plan on showing this film at Ninkasi Studios 155 Blair Street Eugene on April 25th at 6:30pm. Please RSVP if you plan to attend. – 541 342 7005 or email us at caddiseug@yahoo.com to confirm your attendance. This entry was posted in Oregon Conservation News, Oregon Salmon fly fishing. Bookmark the permalink.